Modular knitting designs rely on the smaller pieces from which they are constructed for their shaping, and their overall silhouettes. The simplicity of this construction enables knitters to create unique designs without following a pattern. Instead, you simply choose the shape(s) on which your project will be based and plan its construction from there. The shapes you select determine the direction of your design. Base your selection on the yarn you’re using, the stitch you want to knit, or the shape you most enjoy knitting. Any shape or combination of shapes is fair game in modular knitting. Squares and rectangles: Right angles are incredibly versatile. Squares, diamonds, and rectangles of any size or combination work well together and are simple to join. 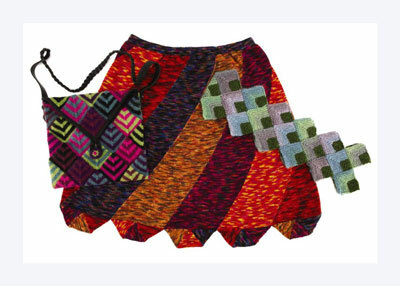 Triangles: Both right and equilateral triangles are great candidates for modular knitting. Turn them in any direction to make interesting combinations. The points of triangles naturally enable you to direct attention to key areas within your design. Curves: Circles, fans, and spirals make fascinating modular knitting. Their rounded edges echo the curves of human bodies, making them natural choices for feminine looks. The fullness at the edge of a circle or curve is easy to use as a ruffle or flounce. After you knit your shapes, you join them into units, creating modules. In addition to the geometry of your modules, their colors have great impact on the finished look of the piece. Plan your units to repeat the same progression of colors, or toss them randomly into place. Just as when you look through a kaleidoscope, the repetition and placement of color changes the look of the shapes you have chosen. The size of each module, after its separate parts are joined, impacts your overall design. One interesting aspect of modular knitting is that you can change the direction, or grain, of different shapes within each module. Try running your knitting crosswise or on the diagonal to play up the characteristics of the yarn you are working with. Once the modules are complete, you join them together to form the finished project. Decide on the silhouette of your finished piece first, then choose the shapes that fit best inside it. Determining the “big picture” from the beginning can make it easier to work the other steps. Once you know the shape you want your piece to take, use graph paper, colored markers, scissors, or your computer’s “insert shape” commands to play with different shapes, sizes, and combinations. You can cut, copy, and paste to your heart’s content before you ever knit a stitch. The method you use to connect your shapes and modules into the whole determines the look of the finished piece. Sewn seams: The simplest way to join the pieces is to sew them together with yarn and a tapestry needle. This method allows you to change your mind about the placement of different pieces as you work, because you don’t connect them until the end. Pick up and knit: If you dislike sewing seams, you can eliminate many of them by picking up the stitches for one piece through the completed edge of another. Slipping stitches along the edges of each piece as you knit it will make picking up even easier. 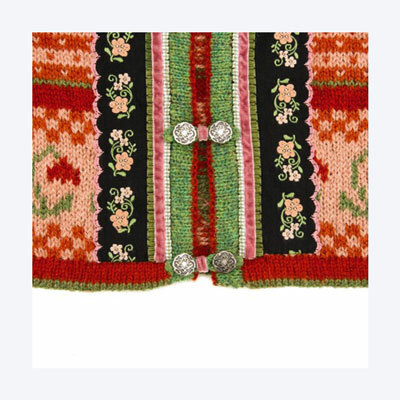 Knit or crochet seams: You can also connect modules by knitting or crocheting their edges together. Both of these methods result in a visible join, which then becomes part of the design. It’s a great place to introduce or repeat a color. You may want to add an edge treatment to the raw edges of your modules. Edgings polish and finish the design, as well as add stability and structure. Ribbing: This old standby finds new life as an edge treatment for modular knitting. Ribbing adds stretch and stability to edges that have an unusual grain or that need to be pulled in closer to the body. Binding: Even more structured than ribbing, a folded knit binding adds a lot of stability to the edges of a modular garment. The bound edge is less elastic than the body knitting, lending support to the piece. If you like heavy or bulky closures, consider placing them on bound edges to support their weight. Trim: Trims such as knitted cord, ribbon, or fabric offer the greatest stability of all, because they are sewn on with a needle and thread. If your modular knitting is loose and drapey, think about adding applied trims to its edges to help it hold its shape.